The recent Federal Budget brought minor inflation adjustments to the Medicare Levy thresholds and a proposed $7,000 increase in the income level at which the 37% marginal tax rate first applies ($87,000 up from $80,000). The $315 annual tax saving from the second item does not provide any significant additional incentive to defer the derivation of assessable income or bring forward allowable deductions. The 2% temporary Budget Repair Levy is still proposed to be removed from 1 July 2017. It is not clear whether this timetable could be impacted by the outcome of the forthcoming Federal election. Gifts or donations of at least $2 to tax deductible charities made by 30 June 2016 are deductible this year. You should ensure the charity is endorsed as a tax deductible gift recipient and that you keep receipts. Where a car has comparatively limited business use it may be more tax effective for an employee to “salary package” the car if permitted by the employer. There is a range of service providers in this area offering novated lease salary packaging opportunities whilst reducing the administrative burden on employers. Please contact us if your net expenditure on these items after Medicare and health fund reimbursements exceeds $2,265 (or $5,343 for certain higher income earners). A Medicare levy surcharge may apply where your income for surcharge purposes exceeds prescribed thresholds and you do not have adequate private health insurance. The 1% surcharge commences to apply for individuals with income for surcharge purposes exceeding $90,000 (singles) and $180,000 (couples) plus $1,500 for the second and subsequent dependent children. The maximum offset of 1.5% applies for incomes above $136,000 and $272,000 respectively. If you expect your income to rise above the relevant threshold and you do not currently have private health insurance, you may need to consider taking it out. The cost of the premiums may be less than the surcharge involved. Where individuals are covered by qualifying private health insurance they may qualify for the private health insurance offset on the associated premiums. This can be accessed as a reduction in the premium or a potential tax refund. Singles qualify for a full or partial offset where their income for surcharge purposes (see definition above) is less than $140,000 plus $1,500 for each dependent child after the second. Couples qualify for a full or partial offset where their income for surcharge purposes is less than $280,000 plus $1,500 for each dependent child after the second. In both cases the offset varies between 9.273% and 37.094% depending on the contributor’s age. If you do not have hospital cover with an Australian registered health fund on your Lifetime Health Cover base day and then decide to take out hospital cover later in life, you will pay a 2% loading on top of your premium for every year you are aged over 30 and do not have cover. Your Lifetime Health Cover base day is normally the later of 1 July 2000 or the 1st of July following your 31st birthday. We discourage investments in tax driven schemes unless they can be expected to deliver sound commercial returns (assistance may be required from an Australian Financial Services Licence Holder to assess the viability of the project). From 7:30pm on Budget night (3 May 2016) the previous caps on non-concessional (i.e. personal after tax) contributions of $180,000 annually or $540,000 brought forward over three years has been replaced with a $500,000 lifetime cap. This includes all non-concessional contributions since June 2007. 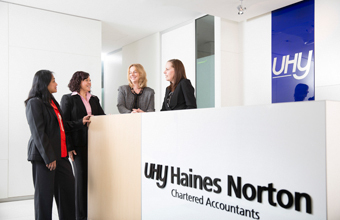 The Tax Office offers a service whereby these amounts will be advised to tax agents including UHY Haines Norton. Excess contributions made before Budget night can be retained in the superannuation environment. Subsequent excess contributions must be returned to the member. From 1 July 2017 the current annual concessional (i.e. tax deductible) cap of $35,000 (if over age 50) or $30,000 otherwise will be replaced with a flat yearly contribution cap of $25,000. This will have a considerable impact on superannuation contribution strategies. Where a member’s total concessional contributions over a rolling five year period are less than $125,000 (i.e. 5 times $25,000) and the member’s balance is less than $500,000 the member can have additional concessional contributions up to the unused cap amount without triggering excess contribution penalties. From 1 July 2017 there will be a starting “cap” of $1.6 million that can be used to fund a fully tax free retirement pension after age 60. A maximum of $1.6 million can be used to fund a pension where the income stream within the superannuation fund remains tax free. If the investment takes the account balance above $1.6 million, the account remains tax free. If the individual has more than $1.6 million in superannuation when they commence a pension the excess over $1.6 million remains in an accumulation account. The income from that account will be taxed at 15% (or 10% for long term capital gains). Any unused cap will be carried forward and indexed in line with changes in the cap. This may impact contribution strategies particularly where a member’s current balance exceeds $1.6 million. Division 293 increases the tax rate on concessional contributions above the threshold and within the contributions cap from 15% to 30%. Currently personal superannuation contributions are not tax deductible where more than 10% of the individual’s assessable income comprises income from employment sources as defined (i.e. salary, reportable fringe benefits and reportable superannuation contributions). From 1 July 2017 employees will be able to top up their employer contributions by making tax deductible personal contributions up to their contributions cap. It is proposed to remove the work test from 1 July 2017. This will make it easier for those over age 65 to make superannuation contributions including spouse contributions. This measure will effectively eliminate the contributions tax in relation to individuals with taxable incomes up to $37,000. The superannuation fund receiving the individual’s concessional contributions will receive a 15% tax offset to a maximum of $500 (i.e. concessional contributions of $3,333). The Government will increase access to the low income spouse superannuation tax offset by increasing the income threshold from $10,800 to $37,000. The maximum offset remains at $540. An anti-detriment deduction can currently increase lump sum death benefits. This is achieved by effectively refunding the contributions tax on the contributions that supported the payment of the death benefit. The current tax deduction will be removed. A Transition to Retirement Pension (TTR) can be a tax effective strategy to allow access to accumulated superannuation entitlements from preservation age (see below) without formally retiring. Under current rules pensions paid before age 60 are taxed at marginal rates subject to a 15% tax offset. There have been no changes announced to the taxation treatment of pension recipients. The changes outlined above will have a significant impact on previous superannuation contribution strategies. Concessional individual and employer superannuation contributions must be physically received by the fund by 30 June 2016 to be tax deductible in the current tax year. In order for employers to avoid a Superannuation Guarantee Charge (“SGC”) shortfall for the June 2016 quarter, the contributions must be physically received by the fund by Tuesday 28 July 2016. The SGC contribution rate rose to 9.5% on 1 July 2014. No further increases are scheduled until 1 July 2021 when it will rise to 10%. The maximum SGC contribution base will increase to $51,620 per quarter from 1 July 2016. This equates to a maximum quarterly contribution of $4,903.90 per employee. Where employees have multiple employers this could lead to a breach of their concessional contributions cap merely as a result of SGC contributions. From 1 July 2013 the previous SGC contribution age limit of 70 was removed. SGC contributions are now required for all employees unless another exemption applies. Mandated industrial award contributions may also apply to these employees. In some circumstances company directors can now be held personally liable for unpaid SGC contributions and unremitted amounts withheld from employees’ salaries under the Pay as You Go withholding tax collection system. Business real property including commercial premises owned by the fund member or a related party (for example, the doctor’s surgery). In some cases, the superannuation fund can borrow to fund part of the purchase of the asset rather that it being a contribution. Considerable care will be required when transferring valuable assets to ensure the relevant contribution cap is not breached. SuperStream is a government reform aimed at improving the efficiency of the superannuation contribution system. Under SuperStream, employers must report super contributions on behalf of their employees by submitting data and payment details electronically. All superannuation funds, including Self Managed Superannuation Funds (SMSFs), must provide contribution details electronically in accordance with the SuperStream standard. A common standard is intended to ensure employer contributions can be streamlined and monies paid in a consistent, timely and efficient manner to members’ accounts. Smaller employers with 19 or fewer employees who are not already SuperStream compliant must complete the transition by 30 June 2016. The proposed 1 July 2016 start date for the related Single Touch Payroll reporting system has been deferred until after the Federal election. Upgrading payroll software – many software providers have updated their software to enable compliance with SuperStream. To check whether your accounting software is compatible with your SuperStream obligations you can check the Australian Taxation Office’s Certified Product Register here. Engaging an external service provider to manage the SuperStream obligations for you. Using a clearing house - Smaller employers (19 or fewer employees) are able to utilise the free services offered by the Medicare Small Business Superannuation Clearing House. Working with your super fund that may have an online solution available to you. Under SuperStream all super funds, including SMSFs, must receive employer contribution data and payments electronically in accordance with the SuperStream Standard. The ESA is the address that your employer will use to send electronic contribution messages to your SMSF. This address is different to an email address. If you are unsure of your SMSF’s ESA, please contact your UHY Accountant to discuss. only receives contributions from related-party employers who choose not to use the SuperStream processes. Should your payroll processes and the in house software you use not be SuperStream compliant, the ATO offers a free optional service for small employers to sign up to for SuperStream reporting purposes. The Small Business Superannuation Clearing House (SBSCH) is a free service available to employers with 19 or fewer employees, as well as those businesses with an annual aggregated turnover of less than $2 million. Through the ATO SBSCH service a small employer can make their super guarantee (SG) contributions as a single electronic payment to the clearing house, which then distributes the payment to employees’ funds. You have 21 days to pass an employee's choice of fund on to the clearing house. Leasing Rule – the collectable cannot be leased to a related party of the superannuation fund. It makes no difference if the lease is at market value or is on terms which are favourable to the superannuation fund. Storage Rule – the collectables cannot be stored in a private residence of a related party. Collectables cannot be stored (even if not displayed) in the home of a member. No Use Rule – the collectables must not be used by a related party. Insurance Rule – each collectable must be insured in the name of the fund within 7 days of acquisition of the item. Presumably, this means that the trustees must effect a policy of insurance which covers the collectable against theft and damage. Given the application of the rules to pre-existing collectables from 1 July 2016, this rule presumably means that the insurance cover must be in place for pre-existing collectables by 8 July 2016. Valuation Rule – if a collectable is sold or transferred (for example as an in specie benefit payment) to a related party, then the sale or transfer must be at market value as evidenced by a valuation provided by a qualified independent valuer. Trustee Storage Decision Rule – the trustees must document their reasons as to their decision as to the storage of the collectables. Documentation means reduced to writing and presumably signed by the trustees or by the chairman of trustees. The documentation for the decision must be kept for 10 years. If the Trustee is unable to comply with these rules, the collectibles must be disposed of before 1 July 2016. The collectibles can be sold to a related party. If disposed to a related party, then the disposal must be at market value and evidence of market value should be obtained – however this can be a trustee valuation based on objective and supportable data. If you are feeling a little under prepared before the end of the financial year, or have any questions about this information please contact us contact us today – we’re here to help.